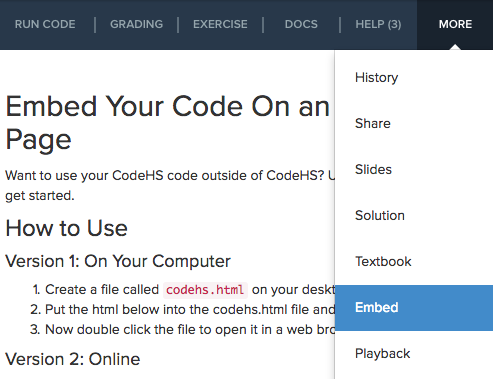 Can Students Embed their Code on a Blog or Website? 1. Open up your program on CodeHS. 1. Create a file called codehs.html on your desktop. 2. Copy and paste the HTML code provided into that file. 3. Double click the file to open it in your browser. You now have a full webpage running outside of CodeHS, locally on your computer! So where exactly do you upload this HTML file so that it is live on the Internet? Well there are several website hosting services that you could use, but one simple option is to make your own homepage hosted on codehs.me!